Before 2011, the annual number of scarlet fever cases reported in Hong Kong was typically below 250, according to the Department of Health. However, since the outbreak in the first half of 2011, Hong Kong has reported no less than 1100 cases through 2016. And 2017 is off to high numbers in the first months. From the beginning of the year through April, Hong Kong health officials reported 780 scarlet fever cases, including 24 institutional clusters involving 17 kindergartens/child care centres and seven primary schools, and 13 household clusters. A total of 84 persons (10.8% of all the cases) were affected, with two to five patients (median: two patients) affected in each cluster. Among the 780 cases reported in the first four months of 2017, the proportion of male cases was 57%.Their ages ranged from two months to 31 years (median: five years). The majority affected were children under ten years old (762 cases, 98.0%). Two hundred seventy-four patients (35.1%) required hospitalization and among them, there was one severe case requiring admission to intensive care unit. This was a five-year-old girl with good past health. She presented with fever, vomiting and rash over chest and abdomen on March 23, and was admitted to a public hospital on March 26. She was diagnosed to have chickenpox and streptococcal pneumonia complicated with toxic shock syndrome. She was treated with antibiotics and discharged on April 3. No fatalities were recorded during this period. 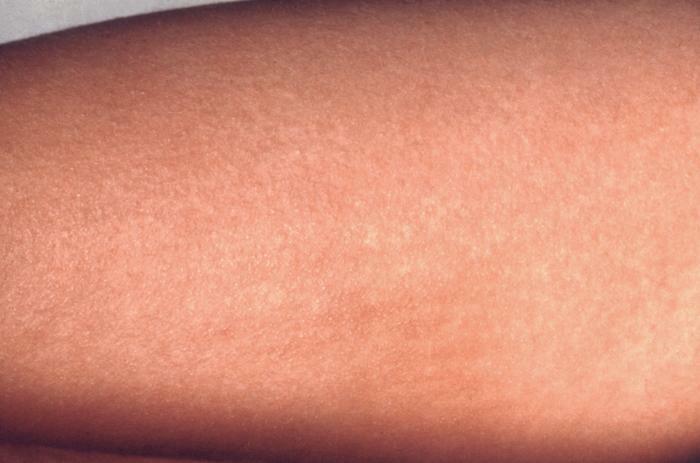 According to the Centre for Health Protection (CHP), scarlet fever usually starts with a sore throat, headache and fever and may be followed by a fine red, erythematous rash, which gives the skin a sand-paper-like texture.The rash may occur at any part of the body such as the upper trunk, armpit and neck, but spare the face, palms of the hands and sole of the feet. The tongue of the infected person may appear swollen, red and bumpy, and have a “strawberry”-like appearance with a whitish coating.